Featured Blog #12 November, 2011 when FBW started, Sir Gil was one of the first bloggers who was invited to join the group. The group member came to know him not only as a blogger but A Man of Dignity and Honor. 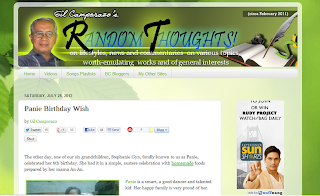 Blog description : Random thoughts on lifestyles, news and commentaries on various topics, worth-emulating works and of general interests. RandomThoughts! is a mixed blog which came to being in 3 February 2011. I blogged about beliefs, family, education, news of general interest, lifestyles, personal experiences which are worth emulating, among others. I'm a simple and reserved type of a person; a writer, journalist, and a blogger; frustrated songwriter and a composer; caring, loving father of 6; by profession, had been a banker, a classroom teacher, and now a public school principal. Inspirational thoughts and ideas on family, education, school administration, church callings. It started sometime in February 2011. So, it already 1 year and 5 months in this July 2012. My desire to write and start a blog was a challenge of my writing skills when Negros Bloggers President H. James Toga added me to Negros Bloggers closed group in Facebook, wherein good writers, good bloggers chatted regularly, especially at night. Every time I opened my computer to browse the Internet I directly signed in to my Facebook account and visited NB Page. There I saw several links of their blogs, which out of my curiosity, I read them all. Until I became get well acquainted with the members of NB and befriended with them. And I sensed my belongingness with this group which is composed of students, government employees, freelance writers, businessmen, realtors, legal luminaries, news reporters who were the pioneers of NB as the core group. As I regularly followed up their blogs, I said to myself, "This is a challenge of my writing prowess to start a blog of my own. But of course not to compete with them for they'd different fields of expertise and mine is different too. Therefore, doing what I could muster to start a blog is the answer. I started with a unique title, RandomThoughts! not knowing that there are several similar blogs with that same title. Well, I started writing with a controlled contents of various topics which I believe could get the interest of my readers. And it did. For a matter of less than a year, RandomThoughts received the award as The Best Lifestyle Blog in 2011 given by the Philippine Blog Award. Likewise, my local dialect (Ilonggo) blog, Tumandok, received the award as The Best Culture and Arts in 2011 given the same by the Philippine Blog Award. "Are They Made for Each Other?" It was our unique true love story of my high school sweetheart and now my wife when we're studying in high school sometime in 1968. It was "unique" in the sense that we had the same birth dates: (month, date, and the year). Thus, from birth certificate to marriage certificate. I really admire Gil Camporanzo on how he writes he can go on vivid details on things that happen years ago and can really write well. I also admire his advocacy as a public school principal and his ideals as a family man. Wow congrats to Sir Gil! 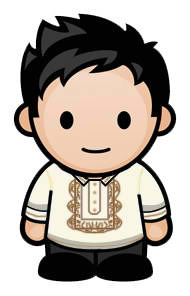 I am an avid follower of his blog and admire his advocacy, the way he shares his ideas and thoughts. I read his love story and he was really very detailed with the situations that led to their love for each other. Such a great writer. Way to cool! - soulmates with your wife? I too, admire Sir Gil! Sir Gil is really an active blogger in spite of his busy schedule as father, teacher and community builder. It's nice to know that Filipino Bloggers are emerging! it is nice that this blog feature bloggers as well . Yes I did stumble with Mr. Gil's blog an it was good. keep sharing thought and provide inspiration to other bloggers as well . congrats sir! I've read some of your posts and they're inspiring! congratulation to Gil's blog. I read his blog always and is very inspiring and you tend to get learning. knowing other's experiences is surely one of the best ways to learn life. Congrats po kay Sir Gil! More power to you, sir! Congratulations Gil for being featured here. More power to you and your blog. It's only been a short time that I've "known" of Sir Gil but I felt his integrity in the blogs he writes and how he interacts in the FBW group. Great feature and I echo everyone's words, more power sir Gil! I actually like reading Manong Gil's blog. To think that in his age (no offense po) he still found writing on a blog a new journey in life. I applaud you, manong, and may you continuously write for many more years. cool. it is fun to share with the world what goes on in your country and compare. i soon came to realize that everyone has the same problems no matter where they live. everywhere is the same. we all now have to work together to make it better for everyone. collaboration for a better world. Thanks to all of you who have shared your inspiring, informative, and uplifting comments. Your reactions will be my added inspiration in writing, in sharing my ideas and thoughts that come along the way. You're a part of blogging venture. You've made me going to keep on writing for I know you're there waiting what will come up fresh from my mind. It is in writing that we share. It is in sharing that we care. And it is in caring that we manifest our loving attitude to everyone. Muchos gracias! Thank you very much. Wow, such an achievement. I hope I can be like him in the years to come. A passion for expressing ones thought does not come by that often.